Prepared by 15 Bytes staff. Unless otherwise indicated UP listings will open on Friday, July 15, 6-9pm. For official Gallery Stroll information visit www.gallerystroll.org. UPCOMING and UP listings should reach us by the last Wednesday of the month. Those accepted will run until the closing date, or for one month if no closing date is given. Readers using the guide are cautioned to check with the exhibitor if the accuracy of the listing is crucial. Please send listings for this page to editor@artistsofutah.org. MODERN WEST FINE ART UP: Duality, a solo exhibition of paintings by John Berry. Berry’s work combines an incredible tension and incorporates a new direction. His bold colors and shapes reference the landscapes he has painted in the past with a dynamic new body of abstract work.Through August 12. UTAH MUSEUM OF CONTEMPORARY ART UP: Exploring power relationships in both the cultural and political realms, Ideologue brings together the work of nine artists who employ humor and hyperbole to address platforms of ideology.Through July 23. AND: Jim Williams: 265 I . . . Home as Self-Portrait gives the public access to a three-decade long process of artistic exploration and transformation as the artist has used his home and personal life as a canvas for his art. Through September 24. AND: Nicholas Courdy: Metaphornography uses collage to explore the ways in which the internet’s availability of media and social interaction shape the complexities within the spectrum of our romantic desires and perpetuate the maximum threshold of romantic fantasy. 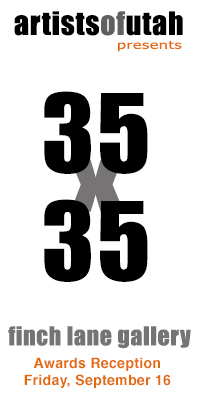 Through July 23. AND: Jennet Thomas: The Unspeakable Freedom Device offers a satirical interpretation of electioneering, voting systems, and cultural extremes in British society. Through July 30. AND:Exploration, intrusive investigation, research and analysis are the foundation of Jennifer Seely’s project Supporting Elements. As a forensic architect, Seely applies her architectural background, understanding of construction and proper installation of construction materials to investigate failing building envelopes (walls, windows, roofing systems, etc. ), fire resistive assemblies, and improperly built buildings. ALICE GALLERY UP: Architecture of Place takes a look at depictions of various structures and environments highlighted in the State of Utah Fine Art and Folk Art Collection. While some works in this exhibition depict Western or Utah specific locales such as Ada Rigby’s papercut of the Salt Lake Temple, or Leconte Stewart’s Cabin in the Hills, others such as Moishe Smith’s rendering of Jerusalem and Karl Pace’s Desert Town at Dusk take the viewer to more distant locations. Through September 9. RIO GALLERY UP: DemoGraphics. This group of artists has created demonstrations or “demos” of a visual vocabulary that each has developed and explores communication with a personal, visual language, asking the viewer to let the artwork be heard. Artists include Paige Anderson, Rebecca Klundt, Liberty Blake, Jenna von Benedikt, Justin Wheatley, Linnie Brown, and Joseph Ostraff. Through September 2. MESTIZO GALLERY UP: Alza la voz con el Puño en Alto, a bilingual exhibit by Mexican artist Jorge Arellano. This exhibit deals with issues of physical, sexual and emotional violence against women. The work shows the faces of women who are fighting against abuse, discrimination and other issues. Through August 12. ART BARN/FINCH LANE GALLERY UP: An installation and collaboration of artists Colour Maisch and Gary Vlasic. The exhibition, Albendeo / Nigredo, blends discarded, broken, and useless objects, and through alchemy, creates new work (see our review page 1). Through August 8. SORENSON UNITY GALLERY UP: Presenting new work by Ella Mendoza, an undocumented immigrant, and self declared illegal illustrator born in the Quechua region of Peru and currently living in Salt Lake City, Utah. Her artwork and writing have been featured nationally in both academic and holistic settings; expanding on themes of race, land, queerness and border displacement. Through August 12. HORNE FINE ART UP: Fly into Travels and enjoy paintings of destinations including Hawaii, NYC, San Francisco, London, Florence, and Paris as well as Zion, Logan Canyon and Bryce. Also get front row seats for the latest backstage dancers by Karen Horne. Through August 12. URBAN ARTS GALLERY UP: Where is My Mind? a group exhibit showcasing artwork that is both surreal and illusory, raising the question, "Where is my mind?" Featuring artwork by Grant Fuhst, Tai Taeoalii, Andrew Smith and other local artists. Through August 12. NOSTALGIA CAFE UP: Secrets, Confessions and True Stories, a memoir through paint that is anything but fiction by Max Dyan. For this exhibit, Dyan has given the viewer the choice to simply view her pieces and take with them what they will, or to open a simple envelope containing the truth about the inspiration.Through August 12. SLUSSER GALLERY UP: Annual Plein Air Painting Exhibition featuring recent landscapes by 10 award winning artists from Utah, California, and beyond. Through June 30. 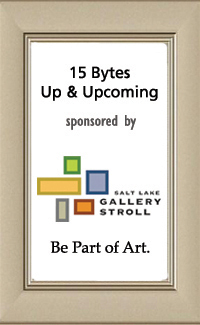 15th STREET GALLERY UP: Plein Air Painters of Utah as well as a diverse group of the gallery’s talented artists on site painting 4-9 pm during Gallery Stroll, July 15. All of the artists participating will be on display in the gallery, in addition on site paintings completed will be available for purchase that evening. Through August 12. ART AT THE MAIN UP: Presenting new work by Sandra Williams. Capturing subjects with color that burst off the canvas to life, Williams’ paintings shows the joy that is her life-long journey through art. Through August 12. GREEN LOFT CO-OP UP: K. Stevenson and Kathy Puzey. Stevenson employs printmaking, mixed media and sculpture to explore the fluid, paradoxical, and trickster nature of memory and perception. Puzey is Associate Professor of Art in Printmaking at Utah State University and has been exhibited throughout the United States and abroad. Through July 9. A GALLERY UP: Featuring new works from A Gallery artists including Emily Robison, Chris Thornock and Darl Thomas. Through August 12. GOD HATES ROBOTS UP: Elmer Presslee: Unprovoked Collaborations.Through August 12. CHASE HOME MUSEUM OF UTAH FOLK ARTS UP: Healing Through Art. Featuring work by refugee artists transitioning and healing from trauma experienced during unrest in their homeland. The participating artists are from the Bhutanese, Congolese, Karen, Burundian, Sudanese and South Sudanese communities. Through August 12. EVOLUTIONARY HEALTHCARE UP: The World Around Us. 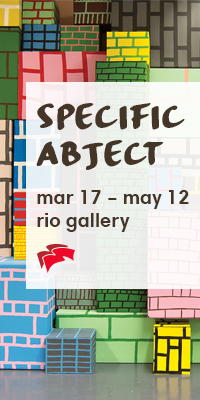 Curated by artrepreneur D. Scott Patria of Ogden, this exhibition features poignant, observational paintings, photography and sculptures of our surroundings - the natural and built environment as interpreted by eight UT-based artists. Through August 12. ART ACCESS GALLERIES UP: Nomenclatures, a group exhibit curated by Angela Broadbent and [Dis]embodied by Marnae Rathke. Through August 12. PHILLIPS GALLERY UP: Summer group show, featuring all gallery artists plus a few new faces, on all three floors.Through August 12. CHARLEY HAFEN GALLERY UP: Cori Redstone's ongoing WALT series is a mixed media grouping of artworks with the forms and patterns of the compositions signifying power, renegade femininity, technology, danger, home making and acts that benefit society. Through August 12. GALLERY AT LIBRARY SQUARE UP: Utah Arts Festival Exhibition: 40 of 117 celebrates 40 years of the Utah Arts Festival with selected work of the past four decades from the Utah Division of Arts & Museums’ 117-year-old Alice Art Collection. CHAPMAN BRANCH LIBRARY UP: Primitive Spirit: Works by David Sharp.Through August 25. SWEET BRANCH LIBRARY UP:The Cayucos Project: Works by Steve Dayton. Through August 20. ANDERSON-FOOTHILL BRANCH UP: HeArt to Recover: Paintings by Colleen Ann Wooten. Through August 12. MARMALADE BRANCH UP: The Abstracts of Brad Lloyd Tear. Through August 3. Reception: Tue, Jul 19, 6:30–8pm July 11 - September 10. UTAH ARTIST HANDS UP:Watercolor paintings from Cara Koolmees and new landscape paintings from Roberta Glidden. Through August 12. DAVID DEE FINE ARTS UP: The Power of Abstraction. Prominent Utah abstractionists Don Olsen, Lee Deffebach and others trained in New York during the postwar era, and brought their skills home, where they created powerful canvases of vigorous brushstrokes, direct color, and honest emotion. Through September 9. ALPINE ART UP: Watercolor Society’s Small Works Show. Juried by Diana Gardiner, Assistant Professor and Adjunct Faculty for the Colleges of Fine Art and Architecture at the University of Utah, all works are rendered in water media and are no larger than 144 square inches which includes the frame. Watercolor artists will be painting and demonstrating during the opening. Through August 12. ART 270 GALLERY UP: ME, MYSELF and I, a retrospective look at the works of T.K.Stephens. Through August 12. CUAC UP: Magical Thinking by Brooklyn based artist Fran O’Neill and A Beautiful Wall by Utah based artist Matthew Choberka. Through August 12. MOUNTAIN WEST HARD CIDER UP: Tess Cook examines the positive and negative aspects of human nature and connects the individual fight for physical, mental, and spiritual nourishment.Through August 12. CONCEPT UP: Striking acrylics on canvas by Tyler Smith. 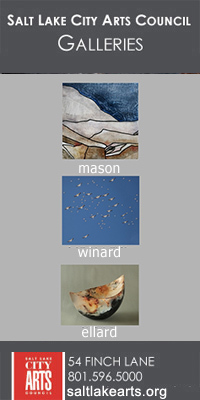 Also featuring Linnie Brown’s mixed media abstracts on panel.Through August 12. MIRI GALLERY UP: ART Before the ART: A Sketchbook Exhibition, a display of several talented artist sketchbooks as well as live sketching. Through August 12. LOCAL COLORS OF UTAH UP: Paintings by Jim Woodward. Through August 12. These listings only include fine art exhibitions. If you are looking for information on lectures, art talks, classes, workshops, calls for entries, employment opportunities and more, visit our message board.